We dried off, warmed up and realised we couldn’t do Land’s End to John O’Groats minus 12 miles! So back we went to the meeting point that they picked us up at, to start again. 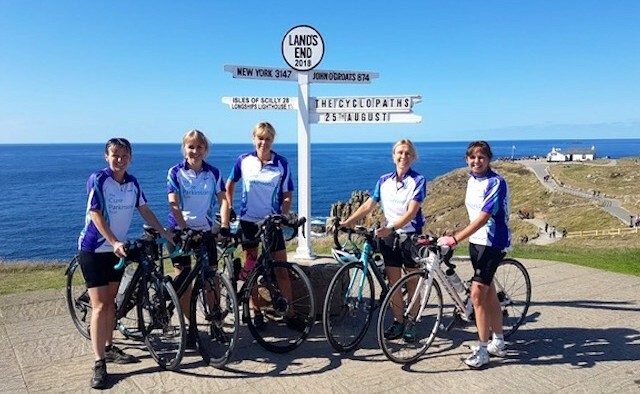 Last year, Alison Anderson and her fundraising team ‘The Cyclopaths’ completed a sweltering 500km cycle through Vietnam and Cambodia, raising £42,000 for Parkinson’s. How old were you when you were diagnosed? I was 46 and it was absolutely devastating. I was working as a nurse at the time, so I looked after lots of people at the end stages of Parkinson’s and I saw a very bleak picture of what my future looked like. Three-and-a-half years later, I’m a lot better. I am fitter and healthier than I ever imagined I could be. Were you passionate about fitness before your diagnosis? I hadn’t ridden a bike for the best part of 10 years and had only run one marathon – something I swore I would never do again! However, when I was diagnosed, I read that exercise was probably the most important thing I could do to help myself, so I started gradually and caught the bug. I got back on my bike and I was hooked – it felt great. It’s the group of us who took on the first challenge in Vietnam. There were 16 of us last year, including my husband, myself and lots of our friends. For this year’s challenge, we recruited another eight people. What motivated you to take on last year’s challenge in Vietnam? I needed a challenge. I recognised I needed something to make me want to get up and get on my bike – or to go to the gym every day and keep that level of exercise going. What was the hardest part of that challenge? The heat – it was 35 degrees every day. The conditions of the roads also made it really difficult. There were bits missing, and narrow tracks along the river where if we wobbled, we’d fall in. Some of the bridges we crossed looked like they wouldn’t stand up to anything – let alone 16 cyclists. Alison stands on the Forth Road Bridge, Scotland. You recently finished the Land’s End to John O’Groats cycle – what made you want to do another challenge? After we got back from Vietnam last year, we all felt a bit flat. We had trained so hard, had so much fun together and had developed a real team spirit. We needed another challenge to keep motivated – we didn’t want to lose our fitness either. We knew Land’s End to John O’Groats was pretty iconic, and much harder physically than Vietnam and Cambodia – which is pretty much flat. The route is over 1,000 miles, and we climbed over 55,000 feet. Physically it pushed us all. There was always someone to support you and get you through the tough times. I could never have done this without the team. What were your personal highlights? I think my best and worst moments occurred on the same day. We were cycling up this massive hill and it was pouring with rain. We were soaked to the skin, freezing cold, and big lorries were going past and spraying us with water – it was horrible. I told my friend that I didn’t think I could keep going so we called the support van who took us 12 miles to the next meeting point. How much money did you raise? We raised about UK £10,000. We didn’t want to do another big fundraiser as we didn’t want to ask the same people for money – but a number of people offered, and we were very grateful. Where do you and ‘The Cyclopaths’ want to cycle next? We’re exploring options, but I think we will be off to America next year. We’re also looking at South Africa, Iceland, Ireland, and lots of other places. I think we’ll be doing this for a long time now. My kids think I’ve become obsessed, but it’s just so much fun! For more information on exercise and Parkinson’s please visit the EPDA website. Sign up to test the GyroGlove!